Process Field BUS (Profibus) Used for interconnection for L2-BUS components. Suitable for use in cell and field areas. Used for the information exchange between different automation systems as well as communication with the connected decentralized field units and where serial BUS systems are used. Industrial Suitable for use in the textile or construction machine industry and medical industries. Profibus L2 Indoor Suitable for indoor fixed applications. Profibus L2 Drag Chain (Industrial) Suitable for drag/energy chain applications. Profibus L2 Torsion & Festoon Suitable for robotic, crane and hoist applications. Profibus L2 Long Distance & Hazardous Areas Suitable for use for fixed installation over long distances such as PA installations. Also suitable for hazardous areas requiring an intrinsically safe circuit. Conductor Annealed wires of plain electrolytic copper. Screening Collective shield of aluminum/polyester tape c/w tinned copper stranded drain wire and overall tinned copper braided screen. Operating Temperature Range Fixed -40°C to 70°C. Minimum Bending Radius Fixed 10 x cable diameter (single strand profibus cables) / Flexible 15 x cable diameter (multi stranded profibus cables). 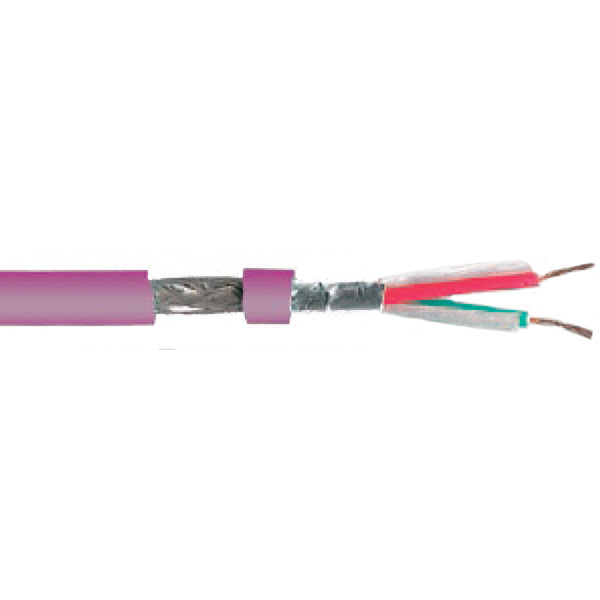 Sheath Colour Violet or Grey (also available in intrinsically safe Blue). Standard Core Colours Red and Green. Relevant Standards Profibus acc. To DIN 19245 T3 and EN50170, UL Style 2571, ROHS Compliant.